There is something to say about a man who puts God first, regardless of his loving family or successful business. Mark Doering of Classic Canyon Ranch has become a shining example of how to run a deer-breeding business. Located in the hill country of Texas Classic Canyon Ranch includes limestone cliffs and caves along with lush creek bottom areas that house century old pecan and oak trees with plenty of food plots for the trophy whitetails. Dense cedar areas on the side of the valleys provide cover and security to the deer which can make hunting challenging. This has made for a paradise that includes both the deer that live on the ranch and the hunters that come to pursue them. We sat down with Mark to discuss a little about his beginnings, his ranch, deer, as well as what he has learned throughout the years. TDA: The first thing we like to do in these interviews is get to know you a little better. We’re always interested to find out where you grew up and how came to love deer. Mark: I was born in Kerrville, Texas but grew up in a little town called Spring, Texas, north of Houston. I was actually born on a hunting ranch. My dad was a school teacher at the time and the ranch owner allowed my parents to live there and help with the deer. So I guess I was in the deer business before I was born. My dad came to own a grocery store and I worked in that as I was growing up. My happiest times were when my dad and I would go hunting together. He loved to deer hunt and he loved to turkey hunt. We would go back to Kerrville to hunt. I always wanted to someday have a hill-country looking ranch with a bunch of deer on it and that is what has happened. TDA: Can you tell us a little more about that ranch? Mark:My ranch is located in the central part of Texas at the top of the hill country. We’re in-between Valley Mills and Gatesville, Texas near a little town called Mosheim which means “Peace” in Hebrew, by the way. We’re seven miles upstream of George W. Bush’s ranch on the Middle Bosque Creek. We’ve got about 660 acres under high fence and feel very blessed by God to be the stewards of this beautiful place for a while. We started breeding in 2005. So it’s been going on thirteen years. We currently have eighteen breeder pens. We run about 200-300 head of deer in our pens. We also have horses and minarure longhorns. TDA: Can you talk to us about your foundations? Mark:Like a lot of people in this business you start off with a high fence ranch and say, “Hmm, my deer are not as big as I would like for them to be.” So, you decide to buy some deer and let them go on your ranch. And then you realize that may not be the quickest way to achieve your vision, so you put up a few pens where you can put your does with the big bucks. When I first started it was a time before DNA was commonly done on all deer. I went through a really sharp learning process for the first few years before I found out how important DNA was and how important does were to the success of your program. Now, that was the early years. I’m a lot smarter now. I’ve paid my dues and learned a lot. What I have tried to do is use the best of what other people have developed that has the look I have always liked. One of my foundation lines goes back to VC 2-Wide, which is Venado Creek’s 2-Wide, who came from The Refuge. I’ve built a foundation doe herd out of does that go back to his sister or womb sister. Also two of my breeder bucks that I am very excited about are out of that line. This includes Classic Lone Danger who is a four-year-old, big, clean, typical that scored 260 inches this past year. We also have Classic Wizard an amazing yearling, that we are partnered with Rockstar Whitetails on, that scored 266” last year that also goes back to 2-Wide’s womb sister. Then another line I have goes back to Gladiator’s dam. I’ve got about six or seven does that have Gladiator’s mom as the anchor. This Lonehollow line has been very productive in the industry. I now own the dam of Perfect Dream from Texas M3 Ranch and I have another doe out of her I am very excited about. I also own 50% in the dam of Federal Express with Gist Kinsman that we acquired from Cross Canyon ranch. Another group of my deer, that I am really excited about, comes out of RW Trophy Ranch. I’ve have two of my main breeder bucks from this line including Monarch Supreme and Monarch Classic. And I have seven does that either go back to Monarch Classic’s full sister or to his mother including his full sister. I also have does that are anchored by Monarch Supreme, Bambi 20/28 and Big Bob’s dam. I think I have some of the best RW Trophy Ranch genetics in these girls. I also have some excellent does from 7C’s Whitetails, Derby Sands and High Roller Whitetails. I am hoping that if I can take the best of each of these top breeder has that has the look I like and then combine them, maybe I can come up with what I am trying to do. Our tagline since we started the Ranch, and what I always wanted to do, was breed deer that have the classic look. “Trophy Whitetails with the Classic Look” is our trademark. I like deer that are more clean and typical. I don’t breed for total score. I don’t like a lot of stickers going everywhere. I like the more clean Classic typical look. I don’t have any particular pride in one line over another, I just take the best of all of them and combine them in possible new and better ways. TDA: You mentioned your wife was helping you out before we sat down for this interview. Do you have any other family members involved in the day-to-day operations? Mark:Oh yes, my wife Lisa is very involved and helps with all aspects of the breeding business. We’ve only been married for a year but she has been involved for the last three years. She has been in some of my ads that you may see, actually. She is my partner in everything that I do and I could not be more thrilled about that. My son is also involved, Michael, and my daughter Angela who both help out when they have the time to do so. 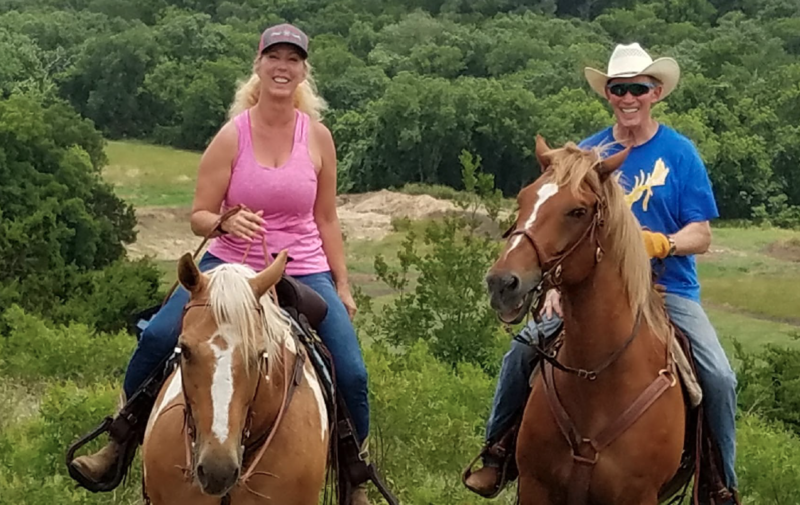 My stepchildren Cassie and Jordan and all their families also love to spend time at the ranch with my special grandkids that all love to come to the ranch to see the animals, help find baby deer and lend a hand during AI. TDA: Would mind talking a little more about what it was like starting the business? Were there any pitfalls along the way? It might also be interesting for folks to get your take on the industry before DNA really took off. Back in 2005 when I first started, people were DNA-ing their bucks but not their does because the focus was on the bucks. But once we started DNA-ing everything, it just made everything that much better because now you can look at the bucks and see who the dam and grand dam was. One pitfall early on came by not focusing on the does and not having DNA. Maybe even up to five years ago, the focus was still on the bucks in the pedigree and not so much on the does. I think that has shifted now and most people believe 60% or more of the genetic traits of the deer’s offspring come out of the dam. We all like to focus on the bucks because they are pretty and we can see their racks. But I think their contribution to the offspring is in the 30-40% range. I have spent most of my acquisition capital the last few years on acquiring the very best does that I could afford. TDA: So we’ve discussed pitfalls. Is there a moment you are especially proud of during your run in the deer breeding business? Mark:You know this is a very humbling business. My degree is in Aerospace Engineering and I spent most of my career, after I got hired by Exxon, becoming a successful oil and gas man. But nothing has been more challenging than becoming a top deer breeder. There are so many variables with these animals and also they can be very hearty one day but find new and inventive ways to kill themselves the next. Learning about vaccines and animal husbandry for these magnificent animals has been the biggest challenge for me. I’m still learning every day. One thing maybe I am the most proud of is sticking with the original goal we had when we started, which is to produce big, typical bucks that have the classic look. There was a time where everyone was going for the biggest score, the biggest inches, just the biggest deer and it was hard to not get sucked into that. We have stayed with the vision of breeding deer that I like to look at. I think recently there has been a swing back to the more typical looking deer. The hunters seem to prefer that now, maybe because they already have several huge high scoring bucks hanging on the wall would like just a super- sized typical now. It hasn’t been easy and I think growing big, clean, typical bucks, is the most difficult thing for a breeder to do. We may not yet have the biggest or prettiest yet, but that is what we are striving for. TDA:The last question we like to ask is about any advice you have for our readers. Mark:My advice to a new breeder staring out would be don’t go for large numbers of deer. Go for smaller numbers and the highest quality does you can afford. I would rather see someone start out with three to five really good does rather than fifteen to thirty mediocre does. Start out with really good does and breed them with the very best bucks in the country. I think a beginner could then build an amazing herd and avoid some of the problems that come along with having large numbers of deer. We artificially inseminate over half of our does even though we have some excellent breeder bucks. We just figure if there is a better buck out there anywhere in the country then we should artificially inseminate until we find a better buck. Finally I feel so blessed to be in this business and to have so many great friends and partners. I think we all should give thanks to God each day for our family, friends, partners and for these amazing animals.